The word Aloe in Sanskrit means Goddess. Known by such names as healing plant, miracle plant, burn plant, first aid plant, lily of the desert, jelly leek, plant of life and plant of immortality, Aloe vera and related species are well loved and widely used around the world. Originally a native of South and East Africa, this remarkable healing plant flourishes in warm, dry climates such as the Mediterranean. I’ve seen many humongous Aloe plants rising up from the mountainsides throughout southern Italy where I spend my winters. Home in Maine, we grow our Aloe in pots on a sunny windowsill. A member of the Liliacea family, Aloe vera is a succulent perennial, grows in a clump and has long, spiky, grey-green leaves. The yellow-orange tubular flowers bloom at the top of tall spikes that emerge from the center of the plant. There are approximately 400 species of Aloe, but it is the Aloe Barbadensis Miller, or “true aloe,” referred to as Aloe vera, that possesses the most remarkable healing properties. History – Aloes have a history of use going back for at least 5,000 years. In Ayurvedic medicine Aloe vera gel is considered to possess estrogenic properties, and this may be one of the reasons the plant was so highly esteemed by Indian, Arab, Egyptian and Mediterranean women. Aloe was known and widely used in Asia, and is found in the folklore of the Japanese, Filipinos and Hawaiians. Its name is derived from the Arabic word alloeh, meaning bitter, most likely due to the bitter liquid found in the leaves. A Sumerian clay tablet found in the city of Nippur, written around 2,200 B.C., documents the first recorded use of Aloe vera as a laxative. 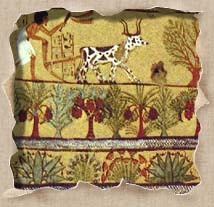 A detailed account of Aloe’s medicinal value is found in the Egyptian Papyrus Ebers, dated about 1,550 B.C. This document records twelve formulas combining Aloe with other substances for the treatment of both internal and external ills. The master of Roman pharmacology, Dioscorides, 41 A.D.-68 A.D., expanded his herbal knowledge and skill as he traveled throughout the lands with the Roman army. He observed that the whole aloe vera leaf, when pulverized, would stop the bleeding of wounds and attributed to its juices “the power of binding, of inducing sleep.” Dioscorides further noted that it “loosens the belly, cleansing the stomach” and was used to treat boils, ease hemorrhoids, heal bruises and dry, itchy skin conditions, was good for the tonsils, gums and mouth irritations, and that it was an effective medicine for the eyes. 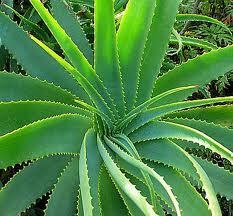 By the year 200 A.D. Aloe had become an essential and vital part of Roman medicine. The plant was brought to the New World by the Spanish in the 1600s. It was planted in gardens and used extensively by the missionaries as well as by the indigenous people as a universal healing agent. Aloe was officially listed as both a purgative and a skin protector by the United States pharmacopoeia in 1820. Medicinal Uses – During the 20th century countless studies were conducted around the world demonstrating Aloe vera to be therapeutic as well as curative for a wide range of ills. Among them, Aloe has been shown to heal as well as to prevent radiation burns, cut the healing time of fire burns by at least half, and heal ulcers, dermatitis and skin diseases caused by parasites. 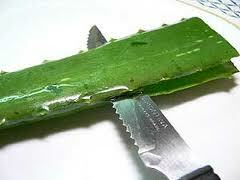 Aloe successfully heals cuts, blisters, sores and acne. It greatly improves skin texture and helps eliminate dryness, itching, eczema, psoriasis and other skin diseases. Studies have shown that aloe regenerates skin cells, eliminates scarring and promotes regeneration of natural skin color. It has effectively been used as a treatment for peptic ulcers, lung disorders, chronic leg ulcers, periodontal disease, seborrhea and hair loss. Aloe is effective against ringworm and other fungal infections, abscess, inflamed cysts and hot spots. Studies performed in the 1960s and repeated in the 1980s confirmed findings that Aloe is highly effective against Staphylococcus aureus, Streptococcus viridaus, Candida albicans, Corynebacterium xerosis, and the five strains of Streptococcus Mutant, and that it is nontoxic. Furthermore, Aloe quickly relieves pain, eliminates soreness, irritation and swelling, and is a very effective treatment for herpes and shingles. Researchers concluded that Aloe is a powerful anti-inflammatory and antimicrobial agent and is effective against a broad spectrum of micro-organisms. Studies conducted at the Chicago Burn Center demonstrated the ability of Aloe vera to heal third degree burns and frost bite up to six times faster than accepted modern medical treatment. Dr. Heggars, M.D., who directed the study, concluded that these healing effects were due, at least in part, to the steroidal compounds and salicylic acid present in the whole leaf. He found that Aloe eliminated scarring; normal skin color returned, and the hair follicles were completely regenerated, allowing for re-growth of hair in burned areas of the skin and scalp. Aloe was found to be more effective in preventing and controlling infections than Silver Sulfadiazine. Researchers at the Linus Pauling Institute concluded that drinking Aloe vera juice helps improve protein digestion, promotes balance of digestive bacteria, relieves indigestion and reduces acid stomach. They also found that it helps normalize bowel movements, controls yeast infections, can be a benefit to those dealing with irritable bowel syndrome and colitis, and that it has no toxic effects. Researchers from Okinawa, Japan, reported in the Japanese Journal of Cancer Research that Aloe contained at least three anti-tumor agents, emodin, mannose and lectin. When Dr. James Duke, the well known and much beloved herbal educator, was with the United States Department of Agriculture, he approved the use of Aloe mannose as a treatment of soft tissue cancer in animals and of feline leukemia. In Traditional Chinese Medicine Aloe vera is considered a cool, moistening, Yin tonic and used to allay irritation, inflammation and infection and also to relieve congestion. A Pharmacy in a Plant – Aloe contains at least 140 individual substances – no less than 70 essential nutrients, including a wealth of vitamins, minerals, enzymes, protein, phytosterols and amino acids. Aloe vera juice offers vitamins A (beta-carotene and retinol), B1 (thiamine), B2 (riboflavin), B3 (niacin), B6 (pyridoxine), B12 (cyanocobalamin), choline, vitamin C (ascorbic acid), E (tocopherol) and folic acid; plus the minerals calcium, chlorine, copper, germanium, iron, magnesium, manganese, potassium, silicon, sodium, sulfur and zinc. The plant also contains the organic acids chrysophanic, salicylic, succinic and uric and all-important polysaccharides, long chain sugar molecules such as acemannen, which act as immune stimulators and anti-inflammatory agents, as well as enzymes such as glutathione peroxidase, and resins. Phytosterols such as B-sitosterol, a powerful anti-inflammatory and anti-cholestromatic, which helps to lower cholesterol levels, and lupeol, a potent pain reliever and antimicrobial agent, are also present. Among Aloe’s ingredients are at least six potent antiseptic agents: lupeol, salicylic acid, urea nitrogen, cinnamonic acid, phenols and sulphur. All of these substances kill or control mold, bacteria, fungus, and viruses which helps explain Aloe’s ability to eliminate many internal and external infections. Aloe also contains at least 23 polypeptides, or immune stimulators, and so is active against a wide range of immune system diseases. These polypeptides, together with the anti-tumor agents Aloe emodin and Aloe lectin, make Aloe an effective ally for the prevention and treatment of cancer. 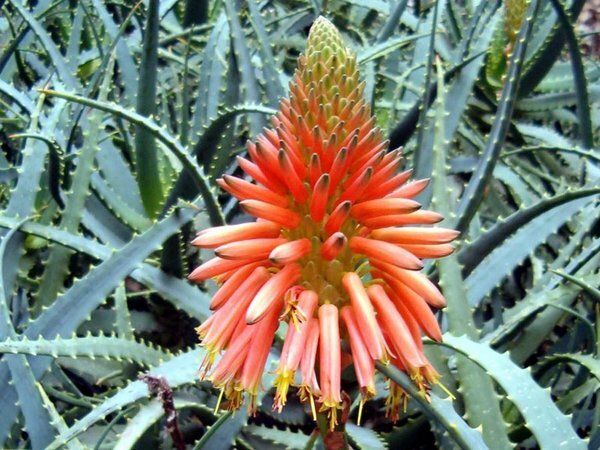 Acemannan, a constituent of aloe gel shown in laboratory tests to have strong immune-stimulating and potent anti-viral activity, is thought to mimic the function of AZT, and is currently being tested as a promising adjunct to AIDS therapy. When 20 ounces of Aloe vera juice was orally administered to 69 AIDS patients per day, symptoms eventually disappeared in 81% of these patients. Directions for Use – Aloe vera is simple to use to treat external conditions, such as burns, wounds and skin afflictions. The clear gel inside the leaf has an immediate soothing effect and places a protective coat over the affected area, speeding the rate of healing and reducing the risk of infection. This action is due in part to the presence of aloectin B, another immune stimulating constituent present in the gel. To obtain the gel, cut a leaf in half along its length and apply the inner pulp to the affected area. The yellow sap that oozes from the base of the leaf when it is cut is called bitter aloes. This bitter sap contains anthraquinones which are a useful digestive stimulant and act as a strong laxative. Anthraquinones also bind to calcium in the urinary tract and significantly reduce urinary calcium crystals. Aloe can be used to prevent stone formation and reduce the size of kidney stones. Aloe juice, made from both the skin and gel of the plant, may be a useful therapy for those with diabetes type II, as laboratory studies show that it can stimulate insulin release from the pancreas and reduce blood sugar and triglyceride levels in the blood. Throughout history Aloe juice has been mixed with water, milk, wine, honey and many other substances to make it easier to use and more palatable, with no loss of effectiveness. Remember that it is the synergistic relationship between all parts of the plant that make Aloe vera such an amazing healer. Most authorities agree that there is no single agent responsible for Aloe vera’s ability to heal, and therefore using the whole leaf is most effective. In antiquity the whole plant was used, rather than one or another of its parts. The leaves were often ground up and cooked to preserve their medicinal value when traded across long distances. Successful modern studies have used either a combination of the sap and gel, or the whole leaf. Household benefits – Aloe plants improve air quality, and when grown in pots inside the house, help remove toxins from the atmosphere. The plant has a strong reputation in the magical realms; because its leaves emerge from the base of the plant in groups of three, it has been associated with the sacred Trinity since the most ancient times. Additionally, Aloe vera is believed to protect the home and its inhabitants from the evil eye and when kept in the kitchen, helps prevent culinary mishaps. Caution: People with heart disease, kidney disease, or electrolyte abnormalities should not take aloe internally. Topical use of Aloe is entirely safe during pregnancy and breastfeeding but oral use is not recommended. Gail Faith Edwards is an internationally recognized Community Herbalist with over thirty years experience. 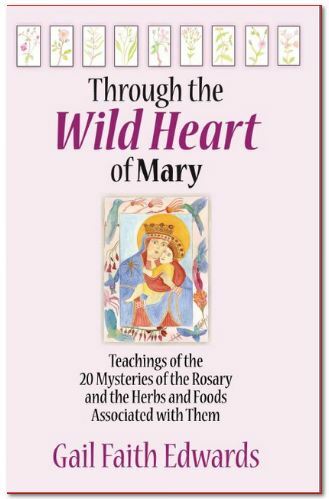 She is the author of three books about herbs and herbal medicines; Opening Our Wild Hearts to the Healing Herbs, Traversing the Wild Terrain of Menopause and Through the Wild Heart of Mary; Teachings of the 20 Mysteries of the Rosary and the Herbs and Foods Associated with Them. Gail has taught Herbal Medicine in India and Italy, at the Yale School of Nursing, the University of Maine and College of the Atlantic among others. She is the founder of Blessed Maine Herb Farm and Director of the Blessed Maine Herb Farm School of Herbal Medicine. She is the mother of four grown children and the grandmother of two. This entry was posted in Uncategorized and tagged herbs. Bookmark the permalink. So perfectly written, thank you! Thank you for this beautifully written piece about aloe vera. How grateful I am to be using this miracle plant and her offerings. Bless you!